Joint tenancy is a form of ownership where two or more people share title rights to a specific parcel of real property. If one joint tenant dies, his/her portion of property rights transfers to the remaining owners by function of law. If there are multiple surviving co-owners, they each receive an equal share of the rights. Property held in joint tenancy does not pass to the owners' estates in a will. Therefore, it avoids distribution via the probate process. Iowa Code 558.66 (2013) governs the different requirements for completing the transfer of title rights under joint tenancy. 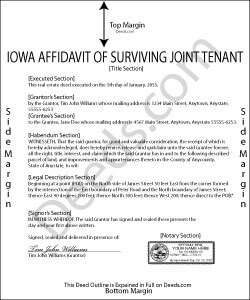 Specifically, the living joint tenant may execute and record an affidavit of surviving joint tenant, which the recorder attaches to the previously recorded deed. An affidavit is a document containing statements, made under oath, which identify the person presenting the material (affiant); the name of the surviving co-owner (often the affiant); details about the deceased owner; the legal description of the property being transferred; recording information from the deed granting joint tenancy; and a request to update the records with the county auditor ( 558.66(3)(b)). In addition, many people include an official copy of the deceased owner's death certificate. Completing this process is an essential step in preserving a clear chain of title to the property, meaning that there is an unbroken history of owners, which reduces the likelihood of unexpected claims of rights to the real estate. A clear chain of title also makes the property easier to sell or mortgage because title agencies will provide the insurance that is usually required as part of the sale. In addition, because grantors (owners) must sign deeds when property is sold or otherwise conveyed, the recorded affidavit serves as evidence proving why one of the named owners cannot sign the transfer. Real estate held in joint tenancy is often one aspect of an overall estate plan. Good practice dictates frequent updates of items such as wills, trusts, and other associated documents. As such, executing an affidavit of surviving joint tenant soon after a co-owner dies protects the rights and interests of everyone involved by ensuring that the relevant land records contain the most current information. Each situation is unique, so for complex issues or with additional questions, please contact a local real estate attorney or other estate planning professional. Rachel F. said: Easy and can add our own additional language in spaces provided. Thank you! Reply from Staff: Thank you Rachel!